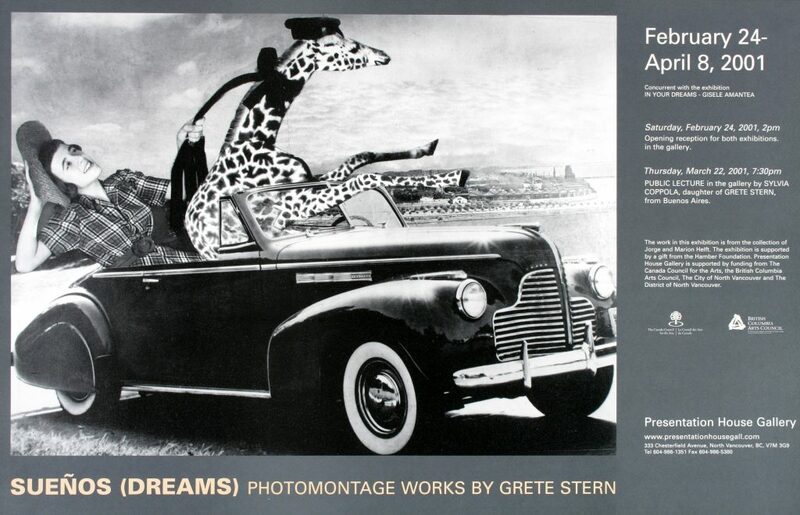 German artist Grete Stern, born 1904, worked in Germany, England and Argentina and was a partner in the photo studio Ringl + Pit in Berlin with Ellen Auerbach. This exhibition features unusual photomontage works, illustrating dreams for a regular feature called Psychoanalysis Will Help You, which were published in the popular women's magazine Idilio, in Buenos Aires in the late 1940s - early 1950s. The exhibition is organized in collaboration with Grete Stern's daughter Sylvia Coppola and Marion Helft in Buenos Aires and is supported by Canada Council for the Arts and the Hamber Foundation. Marion and Jorge Helft generously loaned the exhibition works from their private collection. Poster for the exhibition "SueÃ±os"